The basis of every flawless face is the perfect foundation. Everything else in the makeup application process is built around that, which is why having the best foundation is essential. Whether it be sheer or full coverage, we know you don’t want your makeup to weigh you down or looked caked on. We know you want that flawless look to last all day (and night). But we also know there are too many options out there to count, so we took the hard work out of it. We’ve compiled a list of the five best powder foundations on the market today! And these are absolutely the best of class in the powder foundation world. As always, we want you to have the best experience, and we’re committed to giving you the best and most accurate advice. That’s why we look for honest reviews, overall brand reputation, and hard data about the product. All of that information gets considered when we give our ratings, so you can be assured you’re getting top-of-the-line advice! If you’re looking for the best setting powder ever to be made, look no further. Laura Mercier’s Translucent Setting Powder is award-winning and show-stopping. This isn’t your full-coverage, liquid foundation replacement. It’s quite the opposite. This is an ultra-fine powder that is nearly colorless. It’s meant to set the liquid foundation underneath to keep everything in place and fill in any pores or fine lines. This is great if you have dry or combination skin and need to use a liquid or a cream foundation. After you’ve spent all that time getting your highlight and contour in exactly the right place, you don’t want to cover it up or smear it around. That’s why this powder is perfect. It comes in two shades – light and dark, though they are barely noticeable. The lack of color allows you to see all the work you’ve done underneath. Instead of covering it, it sets the foundation underneath in place so that it won’t run, and it’ll last longer. Plus, the lack of color means you don’t have to worry about it matching your skin tone just right. The powder is also ultra-fine. It’s meant to fill in any pores or fine lines, giving you the perfect, soft airbrushed look. It blurs together imperfections making your face look flawless. That’s also great if you’re taking photos. People will accuse you of photoshopping your face – it’s that amazing. Another positive aspect about this powder is its half-matte finish. It controls oil and excess shine, but not to the point of making you look dried out. This gives your skin the most natural-looking finish. This is perfect for those times you don’t want anyone to notice that you’re even wearing makeup at all! This powder is also long-lasting. It gives you up to 12 hours of wear. We’ve sifted through tons of customer reviews, and this was a major plus from most reviewers. As if there aren’t enough great things to say about this product, we want to include just one more. Cakey-ness is a problem, only not one this product has. This foundation is super lightweight, so you can apply multiple layers if necessary and not have to worry about your makeup looking caked on. Alas, there is one con: the price. Even though this brand isn’t among the ranks of MAC regarding being world-renowned, the price doesn’t reflect that. At a shocking $$$ per ounce, we can safely say the price is a setback. But if you can afford it, you’ll be getting the best powder foundation out there. The quality is worth it. After all that we’ve said about Laura Mercier’s Translucent Powder, it’s probably not a surprise why it gets a 5-star rating. Apply dry or wet as a powder or foundation for a natural matte finish. 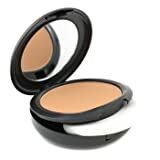 This Lancôme powder foundation is the most versatile powder on this list, making it a fabulous option for any occasion. The first remarkable thing about this powder is that it can be used either wet or dry. If you wanted a thicker, more full-coverage look, you would use this as a wet-application powder. However, if you wanted a lighter, more sheer-coverage powder to use in conjunction with a liquid foundation, you can use this powder dry. Due to its ability to be applied either wet or dry, it can claim to be sheer-to-full coverage. It’s also extremely buildable, meaning you can continue adding layers without quickly getting cakey. It does, however, start to feel heavy if you build all the way to full-coverage. This product also gives options for people of various skin types. If you have dry skin, you can use it wet, and it won’t dry out your skin like other powders normally would. On the flip side, if you have oily skin, you can use this dry, and it will help control oil and shine all day long! It’s also true-to-color. Most people who have purchased this product have said that it matches their skin tone near perfectly – even if they bought it online. And because this powder isn’t translucent, the shade matters. So, this is a big plus for Lancôme. Another notable and unique thing about this product that we found while reading customer reviews is that it smells nice, although it isn’t heavily fragranced. If you’re one of the many people who apply powders with the applicator puff that is provided, we have some disheartening news for you. The one main flaw people have commented on is that the applicator puff is too thin. However, Lancôme has stated that they’ve considered the comments, so it is possible that the problem has been resolved. Lancôme is a high-end brand that has been around for a long time and has built for itself a solid reputation. That reputation includes high-quality makeup at a high-quality price, namely $$$. So this is a negative as well. Overall, however, this is the best powder foundation concerning versatility and quality. For that reason, we had to make sure it got a spot on our list. However, due to the price and too-thin applicator puff, it receives a near-perfect 4.5-star rating. Everybody has heard of MAC. They’re the most well-known makeup brand in existence both nationally and worldwide. With their astounding reputation and their high-quality products, it’s no wonder why they have at least one product on the list. MAC Studio Fix Plus Foundation is a full-coverage, pressed powder foundation. Pressed powder isn’t as fine as loose powder, which means it’ll give you more coverage. That’s great for covering up any acne spots, redness, or unevenness. MAC liquid foundations have been well-known to have orangish undertones and miss the mark on color quite frequently. However, their powder foundations don’t seem to face the same problem. According to customer reviews, the color was as expected and did not have any funky undertones. MAC’s Studio Fix Plus is also great for oily skin. This powder helps absorb natural oils to keep you looking shine-free all day – especially since it has a matte finish. While its matte finish can help control the shine and make you look more natural, too much matte can easily make you look dried out. So, you’ll want to consider some highlighter to use along with it. One negative that MAC’s foundations are known for all-around is their tendency to look cakey, and this is no exception. If you want the full-glam, beat-that-face look, then they’re perfect. But if you’re looking for a subtler, color-correcting foundation, you’ll want to remember that less truly is more. Another thing we’ve noted from customer reviews is that this foundation does feel a bit heavier than some others on the list. But we can’t knock MAC too much, because full-coverage powders do tend to lean towards the heavier side. MAC Studio Fix Plus is best used in place of liquid foundation, not as a setting powder. If you try to use this to set the foundation underneath, you might end up smearing those precisely-placed contour lines. MAC is an expensive, top-of-the-line brand. Its true, you get the quality you pay for, but you’re spending a lot. This powder will run you about $$ according to MAC’s website. Overall, if you want a powder that will last all day, that is great for oily skin, and that gives you genuine full coverage, then this is the best powder foundation for you. But due to its weightiness, tendency to look cakey, and its price, we’ve given MAC Studio Fix Plus Foundation a 4-star rating. 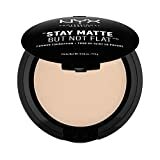 As our only drugstore powder foundation on the list, NYX has made quite the name for itself in recent years as an affordable yet high-quality makeup brand. It isn’t hard to see why, especially with this powder. NYX Stay Matte But Not Flat powder foundation has a considerable leg up over the other powders on this list: the price. It’s uncommon to find high-end quality at a price people can reasonably afford, but NYX has pulled it off. This powder costs a mere $, but with some searching, you might be able to find it as low as $6. This powder is a medium coverage foundation, but it can readily be built up to full coverage without looking cakey. That is due in part to the fineness of the powder, which also gives it the ability to fill in fine lines and pores, making your face look smooth and flawless even up close! Another bonus to this product is that it offers plenty of shades for every skin tone. Not only that, but according to reviews left by customers, the shades match perfectly. This foundation also is considered a half-matte finish, meaning it’s matte enough to control oil, but not the point of looking dried out and dehydrated. It lets just enough shine through to look natural. This product also lasts up to 12 hours, giving you a flawless look nearly all day. Plus, it’s lightly fragranced and smells marvelous. There are two cons, however, namely that some customers with sensitive skin reported major breakouts the following days. Which, they said, was unfortunate, because they were very pleased with the quality of the product. Another not as serious negative is that there isn’t a lot of product to go around. However, for the price, it hasn’t been an influential aspect for customers. Due to the excellent quality and affordability of this powder, we felt it deserved a place on our list. However, due to it not being compatible for people with sensitive skin, we felt compelled to give it a 4-star rating. If you’re someone who has sensitive skin – or someone who is just conscious about what goes on the body’s largest organ – then fear not! We have a foundation that you’ll adore. 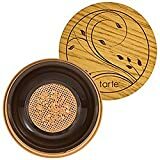 Tarte’s Amazonian Clay Foundation is vegan, which is a huge plus. That’s an area most makeup giants haven’t explored too much. So you can also say goodbye to harsh chemicals and animal cruelty. Tarte is a cruelty-free brand, meaning they don’t test any of their products on animals. We hope all the makeup brands will eventually follow in their footsteps. Another great thing about this product is that it is hypoallergenic. Again, great for people with sensitive skin. It’s also waterproof, which is a claim we haven’t seen from other powder foundations. It also lasts up to 12 hours, which means even if you spend those 12 hours in the rain, your makeup should still be flawless. This loose-powder foundation claims to be full-coverage, which is a great option for people with oily skin to cover up their blemishes and unevenness. However, according to customer reviews, the coverage is actually more like a medium, not full. Meaning you might need to apply a few layers to get the desired coverage you want. This powder controls oil and shine, having a matte finish. However, you don’t need a highlighter to solve the problem of matte finishes making you look dried out. This foundation is produced with something called Tourmaline. It’s a gemstone that is naturally reflective, which gives your face a truly natural shine. Even though this foundation is medium to full coverage, it’s very lightweight. According to customers who have reviewed this product, it’s also easily buildable. Plus, it doesn’t flake off as some other, denser powders do. We have a lot of great things to say about this product, but while reading through reviews, we found a common complaint. Tarte’s Amazonian Clay powder is made Amazonian clay. That’s a double-edged sword. On the one hand, it’s natural and great for your skin, but on the other hand, some people noted a slightly red undertone that didn’t go well with their natural skin tone. Another thing worth remarking is that this product is pricey. For only a quarter of an ounce, you’ll pay about $$$. Although, for it being labeled vegan-friendly and cruelty-free, we would expect the price to be a little bit higher. You’re getting higher-quality ingredients in your makeup. So, because this powder foundation is better for your skin than others, the brand is cruelty-free, it’s vegan-friendly, and overall gives you a beautifully-airbrushed look, we had to include this on our list. However, because it is so expensive and has a slightly red undertone, we decided to give this a 3.5-star rating.